Though the earthquake in Yorkshire may have been a surprise – I thought they were more about puddings than tectonic fault lines up there – it is not a surprise that there is an iPhone app for that. You know, when you have an earthquake and want to check where it measures on the Richter scale. Most of them record worldwide earthquake listings complete with maps and magnitudes. These range from disasters like Haiti, 7 on the Richter scale to mild tremors like the Yorkshire one, 3.6. There’s even an app that uses the accelerometer on the iPhone to measure movement and seismic shift.. and you can use it for anything that quakes of course – not just earthquakes, and that includes your cat jumping on your desk. 1. Earthquake, £1.19 on iTunes best features of this app are that you can track and follow earthquakes around the world in real time and integration with Twitter. 2. 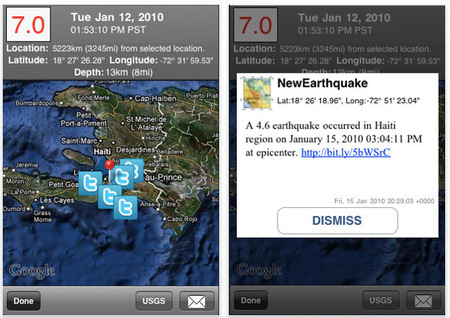 Quakes Earthquake Notifications, free on iTunes. Get push notifications about what the world’s tectonic plates are up to.. Also has map and colour coding. 3. QuakeZones Pro , £0.59 on iTunes. Has data for over 30 years worth of quakes, has push notifications & links to news channels. 5. iFeltthat Earthquake, £0.59 on iTunes. Collates info from multiple different official sources to pick up tremors as small as 0.1. Probably a good one for the UK… Problem seems to be that it it only stores data for 5 days.